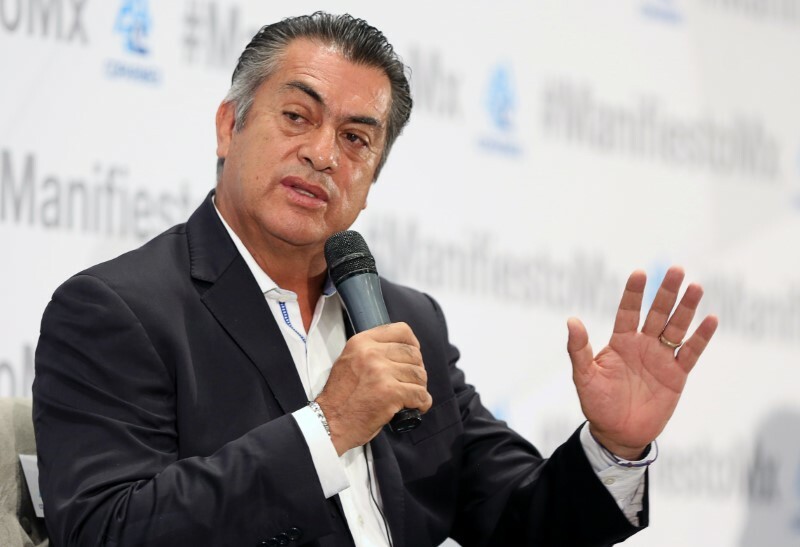 MEXICO CITY (Reuters) – Mexico’s electoral authority has fined independent presidential candidate Jaime Rodriguez for allegedly raising almost $700,000 in illicit campaign funds, in a rare move against a top politician just weeks before the July 1 election. Rodriguez, or “El Bronco” as he is known in Mexico, gathered funds in an irregular manner to finance his campaign, the national electoral institute, INE, said late on Monday. Rodriguez denied wrongdoing. Campaign finance has attracted attention in Mexico in part because of corruption scandals that have rocked President Enrique Pena Nieto’s administration. While hard to prove, activists have documented what they say is widespread vote buying and overspending in election campaigns. For every peso of campaign spending reported during state elections, 15 pesos are unreported, anti-corruption group Mexicanos Contra La Corrupcion y la Impunidad said in a report on Tuesday. Front runner Andres Manuel Lopez Obrador, who holds a strong lead in opinion polls ahead of the elections, has benefited from anger at corruption. He promises to clean up politics in Mexico. Rodriguez trails in fourth place, but his candidacy could still take votes from Lopez Obrador. This is Mexico’s first presidential election to allow independent candidates. INE board member Ciro Murayama said at least $200,000 of the illicit funding was from what appeared to be front companies that transferred large sums to individuals who then donated to Rodriguez’s campaign. INE fined Rodriguez 739,000 pesos ($37,000) and said it had taken its findings to Mexico’s attorney general’s office. “INE knows companies cannot contribute to campaigns. What my friends who have companies did was transfer money from their company to their personal account,” he said. Private companies are prohibited from donating to political campaigns. Last year, Alejandro Gutierrez, a senior figure in Pena Nieto’s Institutional Revolutionary Party (PRI), was arrested in connection with alleged diversion of millions of dollars in public funds by the PRI during 2016 state elections. According to INE, Rodriguez also had public employees work on his campaign during work hours and paid individuals to collect signatures he needed to become a candidate. Rodriguez was excluded from the ballot in April after more than half of the required number of signatures he collected were declared invalid. Later that month, he was reinstated after a court order from Mexico’s electoral tribunal said INE had violated his right to due process.